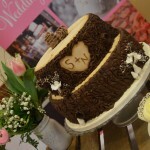 You may have seen that we were invited along to Southend Barns Winter Inspiration Wedding Fair, to showcase our wedding cakes. We were so excited to be invited along as it is one of our favourite wedding venues. 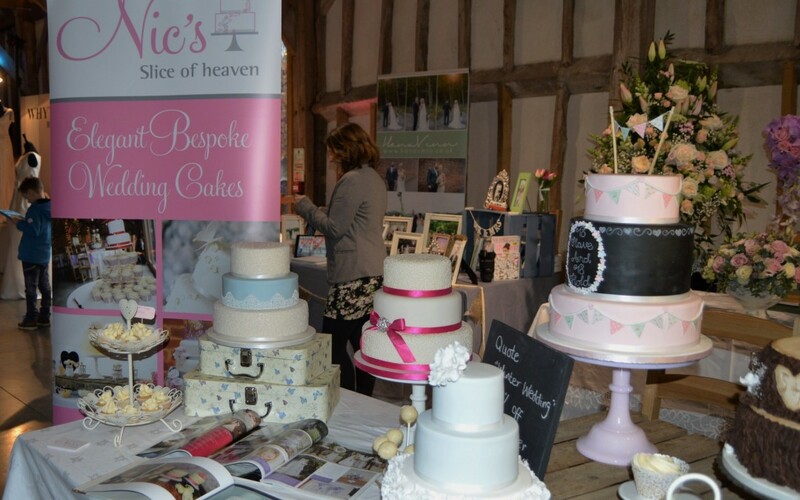 Having visited Southend Barns on a number of occasions, both delivering wedding cakes for our couples and having the pleasure of attending as guests for our friends’ wedding we knew the fair would be a great success. The staff both at the venue and Field and Fork caterers as well as the team behind the scenes at Brightword Communications are amazing at what they do and always so friendly and helpful. 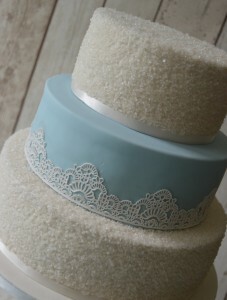 The theme for the day was Winter Inspiration and following this theme the first of our designs included shades of icy blue with bright white edible lace, with the top and bottom tiers decorated in edible sparkling sugar crystals to give it that glamorous sparkly and wintry look. 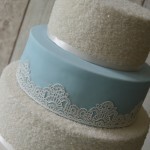 We followed this icy blue wintry design up with a simple and elegant looking cake incorporating beautiful white sugar ruffles on the bottom tier, with the next two tiers in a gorgeous shade of dove grey which is very ‘in’ at the moment, and finally finished it off with a single white open rose on the top tier. 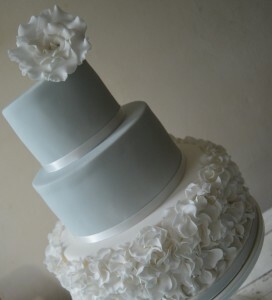 We chose to only add a single sugar rose on the top of this design as we didn’t want to divert attention away from the beautiful ruffles as well as wanting to keep it simple and elegant. This is one of our favourite designs at the moment and is so versatile; not only does it work perfectly with this winter theme but can also be easily changed to compliment any season or colour theme. 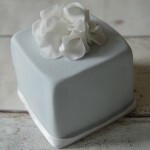 As we loved this design so much we decided to create a square mini cake in the same style to compliment it. 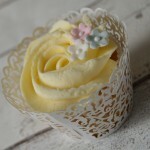 These mini cakes are a great alternative to the traditional wedding cake for those that are looking for something a little different. 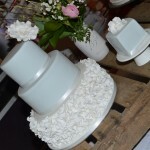 Or what about having mini cakes along side your tierred wedding cake; what could be more fun than a tower of mini cakes to match your main wedding cake! 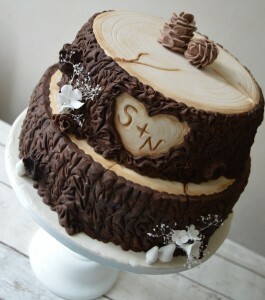 Our next wedding cake design took the winter theme in the autumnal direction with our tree stump wedding cake. This romantic design is perfect for those either having an autumn wedding or who have a love of woodlands and parks, with its delicate carved love heart with the couples initials. This design was finished offer with soft white blossom flowers, gypsophlia and cute toad stools and pine cones, of course. 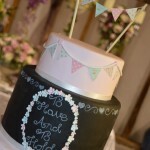 The final design showcased at the Southend Barns wedding fair had a more vintage, summery feel to it with the top and bottom tiers in pastel pink and decorated with colourful edible bunting. 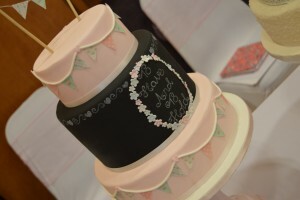 We decided to give the cake a more striking look with the middle double height tier taking the style of a chalkboard and an extract of the wedding vows ‘to have and to hold’ in the centre surrounded by a frame of small, delicate, pastel blossom flowers to match the bunting and tie all the elements together. Of course we couldn’t have a beautiful bunting inspired cake without finishing it off with fabulous bunting on the top as well! 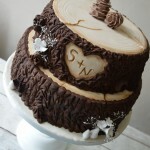 I hope this blog has helped to inspire your own wedding cake design; if you need anymore inspiration or would like to book a consultation to chat about all things weddings, and cakes contact us here.